The unique, wedge-shaped PP-1.2 slides into a hydraulic disc brake caliper to pre-set the piston when replacing pads, aligning pads, and performing other service procedures. This handy little tool makes hydraulic disc brake maintenance and repair faster and easier. No more make shift shims. Brillant little tool helps make pad and fluid changes a snap. Just what i needed. Works great. 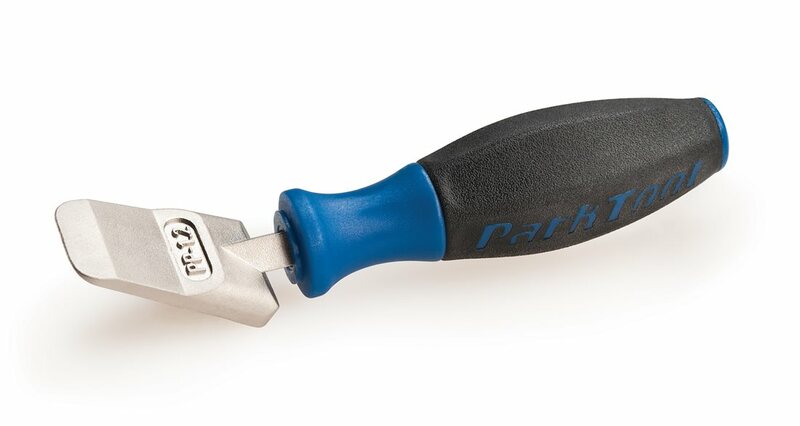 Park tool is quality. Some might say it's unnecessary (in the past I used a tire lever) but like all Park Tools, it makes your life sooooo easy so why not! Much better on the pads than a screwdriver. Angle is nice also. I used to use my plastic tire levers to push the pistons back when replacing my brake pads. However with that method I couldn't push them back too far. After seeing Calvin (Park Tools) use this tool, I decided purchasing it is the right tool for the job. With the piston press I was able to get the proper amount of leverage to push the pistons back. Works like a charm and much better than using tire levers. Everyone with hydraulic brakes must own one piston press. I use this at least every 5-6 weeks. The more you ride the more you need to adjust piston as pads wear. There are a bunch of ways to press brake caliper pistons back in, but for a few bucks you might as well get the tool that'll do it quickly and easily every time. Had to bleed my brakes and figured I'd pick this up with everything else. Worthwhile investment if you do your own maintenance. Using tire levers work just fine, but this is stiffer and makes pushing in the pistons easier and quicker in comparison. Yes, you can use screwdrivers, pliers or random objects to push in pistons, but this just works better. The taper, angled reach, and round handle allows easier manipulation and complete compression so those fat new pads just drop in. Good tool to have it works to push the pistons back to set the brakes. Everyone needs one of these for hydraulic rake work, bleed, adjust. Etc. This tool is almost perfectly designed. I use it for every brake bleed and pad change to move and balance pistons with no risk of damaging Phenolic pistons. Worth the price if you do a lot of your own brake maintenance.